A video from Nismo University explains Nissan’s bold decision to make the Le Mans racer front-wheel drive. We learn very quickly that while it wasn’t a decision the design team took lightly, they had very good reasons to give it a go. In the video, Ben Bowlby, technical director for the FWD Nissan GT-R LM Nismo, first explains that race cars are traditionally rear-wheel drive for reasons of “traction and packaging.” On the other hand, he tells us that, contrary to popular practice, putting the power up front has its advantages. First of all, front-wheel drive means putting the engine up front. This creates a longer so-called “bonnet,” which maximizes down-force, making air resistance much less a factor. “But what about understeer?” you ask. Yes, the Nissan racing team concedes that understeer is indeed an issue. The trade-off is that in slippery conditions, the racer is less likely to spin. Making a front-wheel drive car also makes the LM Nismo very much like road cars. As Jann Mardenborough, Nissan race car driver says, this has everything to do with efficiency. Efficiency is extremely important in a race like Le Mans. Nissan boasts that the GT-R is not just any old supercar—it’s “the supercar”. As one of the very fastest cars available on the market for the modern driver, the GT-R is a beautiful combination of unbridled muscle, prized Nissan technology, and unique character. 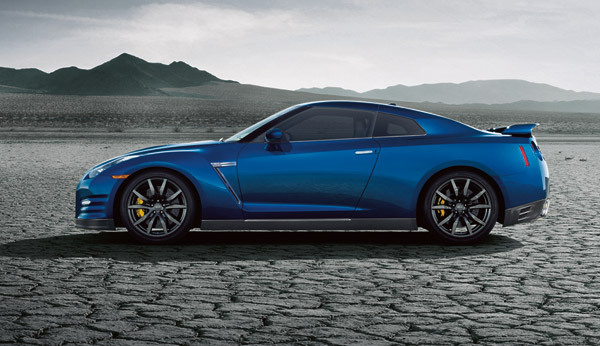 Part of the marvel and praise associated with the Nissan GT-R is its perfect balance of power and control. Despite incredibly high 500+ horsepower, the GT-R is known for superb handling. However, not all critics deem this a good thing, arguing curtly that the car pretty much drives itself. YouTube’s That Racing Channel decided to answer those criticisms with a particularly entertaining video which we’ve included below. The video features two GT-R drivers engaging in a race during which both are pre-occupied, to say the least. As the cars speed forward on perfectly straight paths, the drivers play handheld video games, eat over-stuffed sandwiches, catch naps, and even shave. Obviously, this method of driving is not recommended or realistic, but the video is definitely worth a watch, especially for those of us that appreciate the GT-R in all its glory! Check it out for a good laugh, and come visit us at James Ceranti Nissan!